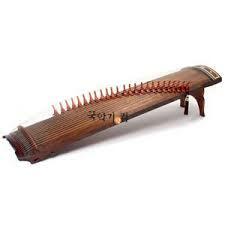 Kayagum(or gayageum) is the most representative Korean traditional stringed instrument. It has a soundboard made of paulownia wood and sides and back made of chestnut or walnut, with silk or silk-wrapped steel strings. It was invented by Kasil, a king of the Kaya kingdom during the early 6th century. 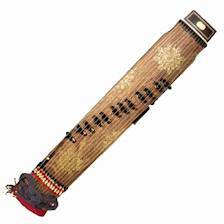 The traditional kayagum used to have only 12 strings suited for the Korean musical scale, but more recently a number of strings have been added, and modern versions of the instrument have 25 strings. Its sound is deep and rich, quite similar to that of a harp, but the kayagum has more of an oriental spirit.